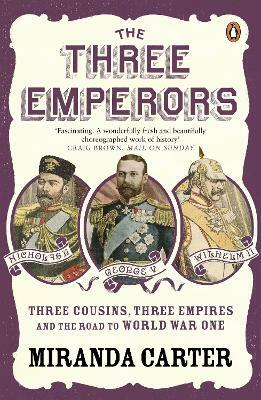 The Three Emperors by Miranda Carter is the juicy, funny story of the three dysfunctional rulers of Germany, Russia and Great Britain at the turn of the last century, combined with a study of the larger forces around them. Three cousins. Three Emperors. And the road to ruin. As cousins, George V, Kaiser Wilhelm II and the last Tsar Nicholas II should have been friends - but they happened also to rule Europe's three most powerful states. This potent combination together with their own destructive personalities - petty, insecure, bullying, absurdly obsessive (stamp collecting, uniforms) - led not only to their own dramatic fallouts and falls from grace, but also to the outbreak of the First World War. Miranda Carter's riveting account of how three men who should have known better helped bring down an entire world is a gripping story of abdication, betrayal and murder. Miranda Carter's first book, Anthony Blunt: His Lives, won the Royal Society of Literature Award and the Orwell Prize and was shortlisted for the Whitbread Biography Prize, the Guardian First Book Award, the Duff Cooper Prize and the James Tait Black Memorial Prize. The book was named as one of the New York Times Book Review's seven best books of 2002. Miranda lives in London with her husband and two sons.